WHO CAN SHOOT: Anyone can shoot, all ages, backgrounds, professions, male and female. (Juniors from 12 years old). SAFETY: Of course, safety is of the highest importance and shooters are governed by a strict set of safety rules. New shooters are first taught to handle firearms safely, then how and when they can shoot. The ranges are controlled by qualified Range Officers, and juniors are expected to be accompanied by a parent/guardian until 15yrs old. EQUIPMENT: Club rifles are usually available to visitors and new members for a limited time. New shooters can then decide to join a club and purchase their own equipment. FOR SILHOUETTE SHOOTING: A bolt action .22 sporting rifle with a telescopic scope is used. 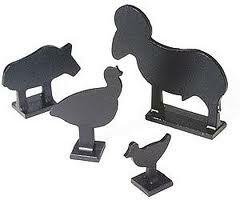 The targets are metallic animals that must be knocked down from a rail to score a hit. Distances are 35m, 55m, 70m and 90m. This makes for a great spectacle as up to 120 silhouettes across the range may be shot in a 4 minute period. COMPETITIONS: Members compete for yearly club championships and competitions are held throughout Queensland and interstate, thus providing many opportunities to travel and meet other shooters. Ladies take heart. There are many women shooters among the sport’s top shooters. HOW DO I GET STARTED ?? If you are interested in shooting silhouettes and would like to inquire further, you will be made welcome at any club that holds silhouette shoots and given the opportunity to observe and try out the sport.